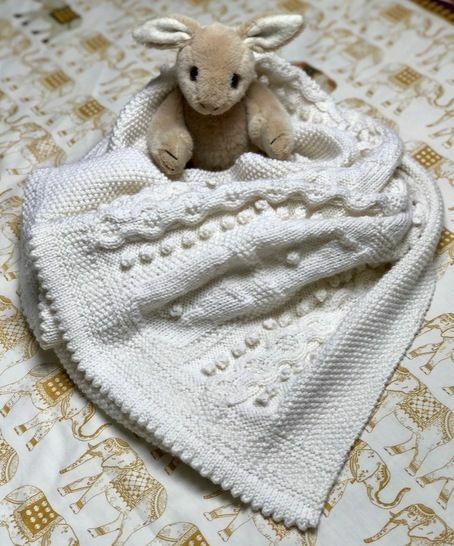 Made from Debbie Bliss Cashmerino Aran, a mix of merino and cashmere mixed with acrylic for wearability, this lovingly designed baby blanket has a luxurious, tactile feel and is large enough to be used as a shawl or afghan. The blanket has been completed in a complementing mixture of Stocking Stitch, Moss Stitch and Garter Stitch and has been finished with picot ends. The completed blanket measures 72 x 130cm approx. For those technically minded, the blanket contains 70 bobbles, 10 bunny pattern repeats and 30 full cables. It requires 16 x 50g balls to complete the size as given. The pattern has been listed as ‘Intermediate,’ but the pattern is clearly written, the cable pattern is a simple one and bobbles are really quite fun to do and easy to master. Either a circular or long (40cm) single point needles can be used. The blanket as shown has been knitted in Debbie Bliss White (300025), though it looks more like cream to me. It's a lovely, gentle colour.